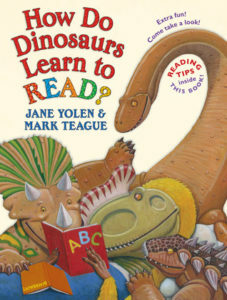 Jane Yolen and Mark Teague have teamed up again with their crew of feisty dinosaurs, this time learning how to read. Not only are they learning how to read but also how to treat their books. From the first line “How does a dinosaur learn how to read? Does he skim through the pages with powerful speed?” to the last, “She reads out each word, till she knows they sound right,” children will learn that reading is a skill worth working for. This would make a fun read-aloud at the beginning of the year with Kindergarten and 1st grade. Read it and then have students come up with good habits about book care and reading.